I'm usually a “wait for the sales” type of person, but Transistor is one of the few games I've bought within a couple of weeks of its release. I sprang for it on the strength of its predecessor Bastion, which is excellent (though it hasn't furnished me with any deep lessons that would make fodder for a blog post). And hoo boy, I was not disappointed. 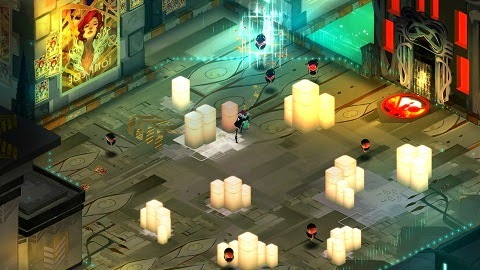 Transistor is one of THOSE games. The ones that stay with you for a long time. Hey, God? Can the New Jerusalem look a little like Cloudbank? Maybe? Apropos of the fact that its protagonist is a singer, Transistor makes skillful use of music and voice to add impact to its story. I was drawn in by the game's premise and beautiful visuals, but I wasn't really sold on it until the first boss fight. As Red confronts one of her nemeses – Sybil, a prominent socialite, now infected by the computerized menace known as the Process – a song begins. It isn't the standard battle fare that advertises excitement or danger. Instead it's slow, quietly intense, and – if you listen to the words – disturbing. As the battle progresses, the quality of the song deteriorates, symbolizing Sybil's descent into inhumanity. In the third round I start to realize that I'm on edge … and it isn't just because Red's health bar is sliding dangerously low, or because Sybil's wall-piercing parasol attack is kind of terrifying. It's because I've been listening to an eerie Borg-like voice wailing “I won't save you” in the background, reminding me exactly what kind of Serious Business I've gotten into. By the time the fight is over, the song is burned into my memory. Sybil had to be dealt with, but her death is not trivial. One can tell, by this point if not sooner, that Transistor is not a light-hearted game. Maybe I should have taken more warning by that song than I did. Another warning note comes when Red stops at her apartment long enough to eat a meal, then proceeds to lock herself out … somehow, she knows she's not coming back. In the story's last act, the surreal, quiet, wistful beauty of a Fairbank district overrun by the Process hints at a journey toward the end. Nonetheless, I wasn't quite expecting what actually happened. Red seldom met another living character, but I was able to get acquainted with the city's cast of influential citizens by means of their traces: digital remnants of each individual's personality and skills, safely stored in the memory of the eponymous Transistor. They're a colorful bunch, sometimes flawed, but all important. As Red hauled this precious cargo around the city, I looked forward to finishing the game and restoring them somehow. Even the members of the Camerata – full of hubris, morally gray, and at times personally unpleasant – caught my sympathy. There were little things I could identify with, like Asher's refusal to be seen without his cat, or the childlike glee of discovery that came through in Royce's study notes on the Process. I wanted to save them all. In the end, I didn't save any of them. 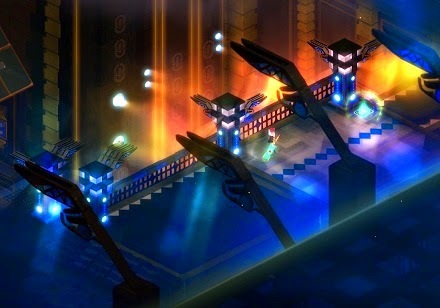 Transistor evokes digital technology with its aesthetics, but it's subtle about it. This isn't a Tron lookalike; the city ends up looking sort of vintage and futuristic at the same time. The effect is unique and delicious. Red finishes her story with the full power of the Transistor in her hands. The engineer's dream: think what you want to create, and it appears. But though the Transistor can repair the buildings and machines of Cloudbank with ease, it can't bring back the people. And without citizens, all the rest becomes worthless. There's nothing left for Red in the city, no reason to rebuild. Cloudbank is done for, destroyed by the machinations of a few people who thought they would forcibly change it for the better. And where does that leave us? Some things can't be fixed. Renewed, yes (as one sees after waiting out the game's final song), but they can never go back to the way they were before tragedy struck. You won't … can't … save everyone. That's the theme this story leaves me with. It's an interesting contrast to Bastion's ending, which allows the player to literally rewind time and clean up the mess. It's also an unconventional message for me to like. I deal with enough of this particular type of powerlessness in real life, so why would I want it in my video games? Yet I appreciate it here, because … maybe it's a lesson I need to learn. I don't get the impression that Red failed, but rather, that she did everything she possibly could to save the city, and was ready to move on. Hers is a different kind of hero's journey in which the attempt is the important element, not so much the results. And this is something helpful for me to remember whenever I'm tempted to beat myself up because I haven't yet solved all the world's problems or created multiple works of genius. Transistor broke my heart for an afternoon, but oddly enough, it's left me with a greater feeling of peace about life in general. I'm also full of inspiration and ready to get back into robotics work. Expect some updates about the artificial muscles, and maybe some other things, in the near future.